An interesting pattern has formed on the Aussie (AUD/USD) daily chart. 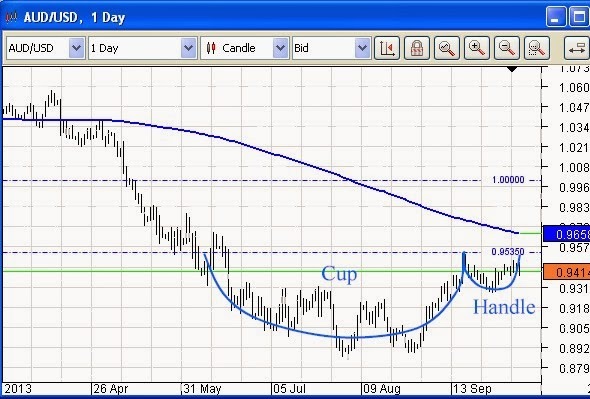 Known as a cup and handle formation, it is associated with consolidation. This is a nice way of saying that market participants are concerned about a number of things that have the effect, in the end, of contradicting each other. According to the accepted wisdom of chart pattern aficionados, the shape of the cup is important. It must be considerably bigger than the handle and, allowing for normal market fluctuation, must be of a fairly regular curved shape. While smaller, the handle must also be well formed. The pattern above fits these criteria. The fact that it is most noticeable on the daily chart is also significant. This is the most important chart for institutional traders and indicators that appear here are watched more that most. The 200 period Simple Moving Average (SMA – thicker blue line on the chart above) is another example. For us the importance of patterns such as this is that they are indeed watched and noted by many traders, and therefore tend to become something of a self fulfilling prophecy, at least for a time. What does the cup and handle above tell us about what might be likely in the future? Well, in addition to being associated with consolidation, as noted, it is also recognised as a continuation pattern. The dominant trend prior to the formation of the cup part was…down. Really appreciating article thanks for this feels good to have this.